This appears to be a typical arrow container capable of holding about twenty arrows. It has three distinct portions, each with a non-dimensional space allowing it to store far more than would normally be possible. The first and smallest one can contain up to sixty objects of the same general size and shape as an arrow. The second slightly longer compartment holds up to eighteen objects of the same general size and shape as a javelin. 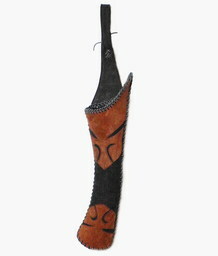 The third and longest portion of the case contains as many as six objects of the same general size and shape as a bow (spears, staffs, or the like). Once the owner has filled it, the quiver can produce any item she wishes, as if from a regular quiver or scabbard. The efficient quiver weighs the same no matter what’s placed inside it.